Now when the apostles at Jerusalem heard that Samaria had received the word of God, they sent to them Peter and John, who came down and prayed for them that they might receive the Holy Spirit; for it had not yet fallen on any of them, but they had only been baptized in the name of the Lord Jesus. Then they laid their hands on them and they received the Holy Spirit (Acts 8:14-17). Baptism, the Eucharist, and the sacrament of Confirmation together constitute the "sacraments of Christian initiation," whose unity must be safeguarded. Confirmation perfects Baptismal grace; it is the sacrament which gives the Holy Spirit in order to root us more deeply in the divine filiation, incorporate us more firmly into Christ, strengthen our bond with the Church, associate us more closely with her mission, and help us bear witness to the Christian faith in words accompanied by deeds. Confirmation classes and Youth Ministry activities are available for students in grades 7 and older. For those also seeking Baptism, formal reception into the Catholic Church, 1st Reconciliation, or 1st Communion, their participation in Confirmation classes may be supplemented by monthly weeknight RCIA-for-Youth sessions. Click here for an Overview of our 2-year Confirmation journey. Parents of students in grades 7-8 must go to our Youth Ministry page to register online and see the calendar of activities. For high school students in grade 9-12, go to the CORE TEAM page to register. Regular Mass attendance and parent involvement is crucial and required to prepare for this Sacrament. First Year Confirmation classes are held the 1st Sunday of the Month from at 10:30am-12:00pm or at 3:45-5:15pm. Youth Ministry meetings for 7th-8th grade and 9-12th Grade students meet on all other Sundays of the month, from 4-5:15pm. 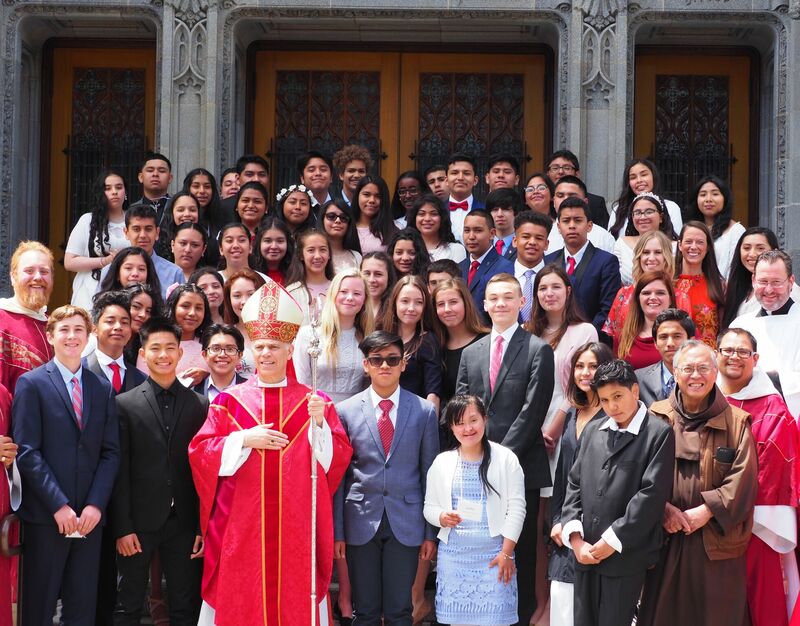 Confirmation students must attend at least two Youth Ministry events each month (Catholic school students must attend only one YM event each month). The Youth Ministry event requirement may also be met through service in a parish ministry, or by demonstrating readiness through Mass attendance and a grasp of Catholic teaching and traditions. For information, go to the Youth Ministry or CORE TEAM pages (links above) or contact the Director of Family & Youth Ministry, Kathy Folan, at kathy@stdominics.org or (415) 674-0446.